As you can imagine, I listen to lots of kids’ music in the search for bringing the best to Babyologists. There are lots of albums that I bypass – I can’t help a little subjectivity entering the decision making process and if I’m not enthusiastic about a CD then I’ll hardly do it justice. The flip side of this is that every so often an album comes along that I unequivocally love. 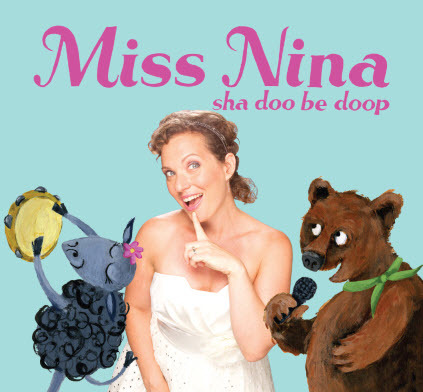 Miss Nina (Nina Stone) has been on the kid’s music circuit for a few years however her new album, Sha Doo Be Doop, is the first that I’ve heard – and I love it. I’m not sure who Miss Nina’s musical influences are but cast your mind back to Transvision Vamp or Kim Wilde and you’ll get a feel for the rock and dance vibe that dominates this album. The opening track, My Hula Hoop, is a seriously good song – whether you’re aged five or forty, it’s a song that sticks – gritty but fun, I couldn’t get the lyrics out of my head for days and my five-year-old, armed with her hula hoop, has basically had this song on ‘repeat’. While other tracks are similar in style (particularly Angry Song and Ridin’ in my Car), much of the album has been influenced by Stone’s favourite children’s books, notably Eric Carle’s classic, Brown Bear, Brown Bear, What Do You See? and Maurice Sendak’s Where the Wild Things Are. The tribute tracks – The Brown Bear Rap and Wild Things, are exceptionally good and kids will love them for the familiar content and catchy beat. Stone notes “We all know how important it is to read to young children, but some children are left out of the picture because adults are not available to read to them regularly or because the kids are not inclined to sit still or concentrate. Setting books to music can open many doors for children.” Uniting music and literature? You can see why I love these songs! Although My Hula Hoop is my stand-out track, New Alphabet is also getting some serious air-time in our house. Think of the very best Sesame-Street-style ditties and add a little edge – if you doubt that the alphabet song could be sung in a new and fresh way, Miss Nina will show otherwise. Sha Doo Be Doop is suitable for children aged one year and over. It’s available via iTunes or from Amazon.